It looks like someone else has invited you to join using this email address. If you continue this registration, you won't have access to the courses they've invited you to unless you buy them separately. The best option is to go back to the email you received and click on the green button. If you don't have it anymore, ask them to resend it. If you'd like to continue, click Continue; if you want to cancel and look for that email, click Cancel. Enter a password below to create your profile, or to log into your existing profile. Do you really want to delete this user? It's permanent, can't be undone and you won't be able to invite this driver back. All data will be deleted and access to courses will be revoked. Do you really want to delete request from this user? Do you really want to delete sharing your profile with this user? Do you really want to delete this test result record? Do you really want to delete this training record? Do you really want to delete this qualification (experience) record? Upgrade your account to a company/fleet account? You are about to upgrade your account to be able to manage other drivers. You can assign other users to help you manage those drivers. These Managers will be able to see your training history, too. If you would like to keep your own training history separate, please log out then purchase the drivers using a separate account with a different email address. How many more drivers do you need? How many more course licences do you need? What licences are you studying, or do you already have? It's simple: create a profile and you'll see your most recent test results and how you are improving. You can't generate certificate until you've filled in your name. You can't generate certificate until driver has filled in their name. Your administrator has not made this section available to you. However, these modules are also available within Driving rules and the Road Code in the Fleet Driver Plan and you may have access to them there. You're using our Guaranteed Drivers plan. If you would like to add or remove drivers, or revert to a standard plan, please contact us. Why should you slow down when you see this sign? Why should you slow down when you see this sign? This sign warns of a loose road surface that can cause chippings to fly out from your tyres and cause damage to other vehicles, or injury to pedestrians, cyclists and motorcyclists. Reduce your speed to lessen the risk. The technology used in sealed roads has not improved enough to cope with the volumes and weight of traffic that we subject it to therefore road maintenance is an ongoing chore. When driving around roadworks, speed limits may apply – usually 30kph if there are people working there. In this article we’ll show you the road signs that you will encounter around roadworks, plus the common causes of roadworks in terms of asphalt or tarmac degradation. The following road signs give you an idea of how long the roadworks extend along the road and whether they might affect your travel time significantly. For larger roadworks there may be site access for machinery. This will be signposted. Be aware that works vehicles may slow down to pull in here. If there are roadworks that force a lane closure, then you may see one of these signs advising a lane is closed and you must merge, or that lanes deviate from their normal course. NZTA has a State Highway roadworks program which usually involves spreading stone chip over a layer of hot sprayed bitumen. City streets and motorways have a different asphalt mix, but all will end up with some or all of the following signs of fatigue. 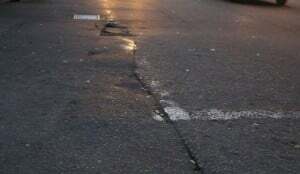 What asphalt maintenance is required? Large rectangular cracks appear on the surface. They are not necessarily deep and are actually made worse by low traffic volumes. 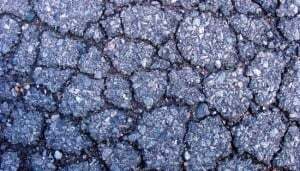 If block cracking is premature the usual cause of it is human error: road workers place the mix too dry. It also happens when the road gets old. It can be fixed with a thin overlay, or special treatment of the crack. Settlement depressions are caused when the underlying base is compressed over time, or settles naturally. This causes lower areas in the tarmac where water can pool. If this water is deep enough it can cause problems with aquaplaning. Settlement depressions are low priority in terms of fixing. Alligator cracking consists of many small cracks that look similar to a reptile’s scales. It has many causes such as poor drainage, a thin or weak surface or base, or excessive heavy traffic. Small weaknesses in the surface quickly spread. The asphalt must be completely removed and replaced to its full depth. Tarmac is almost never laid in one sheet for the entire road width, and that means that there are joints. Longitudinal cracking is almost always caused by poorly constructed paving joints, and therefore mostly appear down the centre of the road. If there are large temperature variations during the day this will exacerbate the problem. Once a small fracture or crack appears in the surface, water and other grit can get in and they begin to erode the edges. Frost and temperature changes accelerate the process. As the crack becomes wider, the effect of vehicle tyres crushes the edges and gradually the pothole becomes wider. Pieces around the edges become dislodged and removed by the action of vehicle tyres. They are usually repaired by filling them. 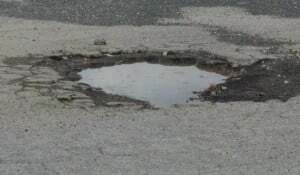 Potholes can be deep enough to cause damage to vehicles, and they are dangerous for motorbikes. 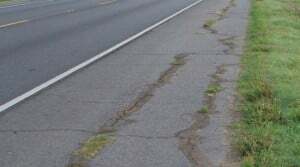 If there is an issue with subsidence on the edges of the roads, edge cracks will appear. It can be accelerated (or caused) by heavy traffic that uses the shoulders of the road such as agricultural machinery. If the road is bordered by vegetation such as grass, this will also break up the tarmac. A weak surface layer or base and poor drainage and/or frost will only make things worse. Test your knowledge of road code signs by taking our free quiz here. Copyright 2010-2019 DT Driver Training Ltd, PO Box 12541, Penrose, Auckland, 1642. All rights reserved. Questions and images are used with permission from NZTA; question answers are proprietary.